Timber harvest does not require a permit from the ADF&G Division of Habitat, however many activities related to commercial or personal use timber harvest (e.g. road building and water withdrawals ) that occur in fish-bearing waterbodies will require a Fish Habitat Permit. Our permitting authority for timber related projects is focused on protecting fish and their habitats. The Alaska Forest Resources and Practices Act (FRPA) governs how timber harvesting, reforestation, and timber access occur on state, private, and municipal land. Forest management standards on federal land must also meet or exceed the standards for state land established by the Act. 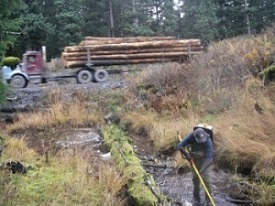 The FRPA is designed to protect fish habitat and water quality, and ensure prompt reforestation of forestland while providing for a healthy timber industry. The Alaska Department of Natural Resources (ADNR), Division of Forestry is responsible for oversight of timber harvest under the FRPA. The Division of Habitat works cooperatively with the ADNR and the Alaska Department of Environmental Conservation to implement the FRPA statewide. ADF&G helps identify and provides comments relating to important fish and wildlife habitats. We coordinate with other divisions within ADF&G when reviewing timber sales and harvest activities. Additional information on the FRPA and detailed Best Management Practices can be found at the ADNR’s Alaska Forest Resources and Practices Act website.